When a soldier posted in Northern Canada makes a routine trip to a nearby lab, finds most of the scientists slaughtered and shepherds the sole survivor back to her outpost, she unwittingly unleashes one of Marvel’s most psychotic and popular villains on her fellow soldiers. Shortly after violence erupts in the outpost, a mysterious man in black arrives who may be the soldiers’ only hope of salvation. From start to finish, Shiver feels like Alien transplanted into the world of the Super. That said, the story isn’t half-bad. It isn’t particularly remarkable; but it’s suspenseful and scary, with a surprise ending that gets you curious about what’s to come. Early on, it’s clear this is a series that suffered in the floppy format due in no small part to Way’s falling in line with Marvel’s Jemas-era philosophy that rarely featuring the main superguy helped build suspense. Venom doesn’t show up until the very end of the second chapter. It works in the trade, but it’s easy to imagine monthly readers getting frustrated. 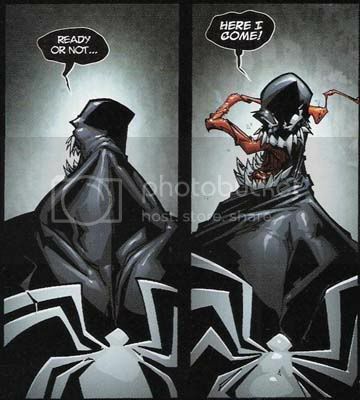 Fans of Venom’s web-headed nemesis should know that Shiver seems to break from standard continuity, in that the symbiote attaches itself to hosts and uses them up in a matter of hours, whereas I’m pretty sure in his earlier appearances Venom stuck with just one guy for a prolonged period. Neither the pacing nor any splits from previous Venom history weakens this trade as much as Herrera’s art. His exaggerated, droopy style is completely mismatched with the story’s tone. It seems clear Herrera’s renderings of Venom himself, which are admittedly very creepy and evoke the chaotic nature of the character, were the main factor in the decision to sign him on to the book. Unfortunately, as was already mentioned, Venom’s appearances overall are sparse and he’s by no means the protagonist in spite of the title of the comic. Most of the characters are perfectly human and Herrera’s treatment of anatomy is sometimes simply too cartoony for a horror story, and other times it’s just plain embarrassing. If it weren’t for Herrera, I’d probably get myself a copy of the second trade. I bought this trade in part to get a sample from the writer who will be scripting an upcoming arc from my favorite green guy’s home title. While I read a lot of negative stuff about him (mostly on message boards where the biggest complaints revolved around his demeanor during interviews and his stated apathy towards continuity), I was happy with the story. It’s no Watchmen, but it’s a solid and compelling horror/sci-fi tale. With Herrera on the drawing duties, however, I won’t bother. I don’t necessarily think that’s indicative of Herrera’s talent, either. I just think he was the wrong guy for the project. 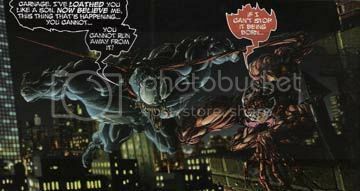 Initially at each other’s throats, symbiote villains Venom and Carnage form an uneasy alliance when they learn that Carnage’s offspring is more likely to walk the path of a hero. With yesterday’s review of Marvel Team-Up, and my review a few weeks ago of Essential Super-Villain Team-Up, I’ve learned not to judge a book by its title. 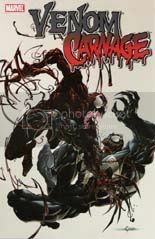 Venom Vs. Carnage’s title is as misleading as the aforementioned examples. While the two villains do tussle a little bit, mostly in the first chapter of the trade, the story doesn’t center on their conflict but on the origin story of a new hero: Toxin. NYPD officer Pat Mulligan is the host of Carnage’s offspring. His life is turned upside-down as he realizes he will soon have to join the desperate world his brief tutors - Black Cat and Spider-Man - inhabit day after day. His final decision at the end of the trade tugs at your heartstrings a bit, but for the most part there’s nothing particularly original or impressive about the story. Nice guy gets powers he doesn’t want. That sums it up. 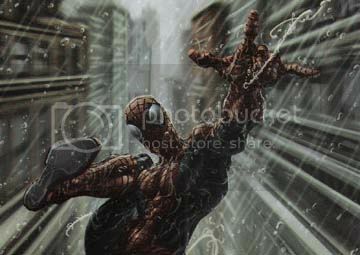 Clayton Craig’s art is either the story’s biggest weakness or greatest strength, depending on where your tastes lie. His art has a kind of bas relief feel to it, as if the lines and contours were rising off the page. His action scenes are spectacular, though in some cases the dark colors can confuse. In spite of the gratuitous Black Cat T-and-A shots that promise to render hundreds of copies of Venom Vs. Carnage as sticky as Spider-Man’s webs, Craig’s drawings of the non-super could use some work. There’s a very strong generic and stiff quality to the faces of his subjects, something like what you’ll find in digitally-rendered TV cartoons. 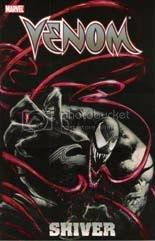 Despite some cool action sequences, Venom Vs. Carnage left me wanting, and it certainly didn’t convince me to check out the mini-series it acts as prequel to: Milligan and Darick Robertson’s Toxin.